Professor David Anderson, PhD student Martin Walker, and team of students and volunteers spent May of 2017 leading a mini-term field school at the Topper site in South Carolina, where for the last three years they have been examining Late Woodland deposits dating from ca. AD 800-1200 in an 85-square-meter block excavation (pictured above). While bone preservation is poor in the sandy soils, one of the unique finds (pictured) was the fragmentary remains of a dog skull with several pieces of white chert. As an unusual specimen of pre-European dog, the team reported the information to one of the British directors of the world dog DNA project. This pre-contact, early North American dog will serve as an important addition to their worldwide collection for mapping the genetic prehistory of dogs and their domestication. 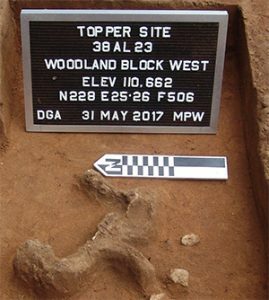 In addition to this unique discovery, the team located dozens of features, thousands of pottery sherds, over a hundred arrow points and associated stone flake debris, several pipe fragments, and numerous paleobotanical remains, with maize and other domesticates identified in several features.